Richard Clyburn invented the adjustable spanner in 1842. He registered the design in September 1843. This versatile tool can be adjusted to fit a variety of nuts and bolts and allows a single adjustable wrench to replace an entire set of fixed spanners. Richard Clyburn (1796-1852) born in Yorkshire was a Consulting Engineer in the Agricultural and Textile industries in Gloucester. He made high precision tools from both wrought and cast iron. In 1836 he was the Engineering Manager and partner in the Uley in Gloucestershire Iron Works with George Lister, also from Yorkshire. Clyburn's spanner design with open end jaws was pioneering. It also featured rack and worm that he would have discussed with engineering work colleague Edwin Budding. Clyburn even produced a double ended adjustable spanner. Clyburns adjustable spanner design remained in production in Birmingham factories and worldwide, and appeared in tool catalogues up until about 1964. 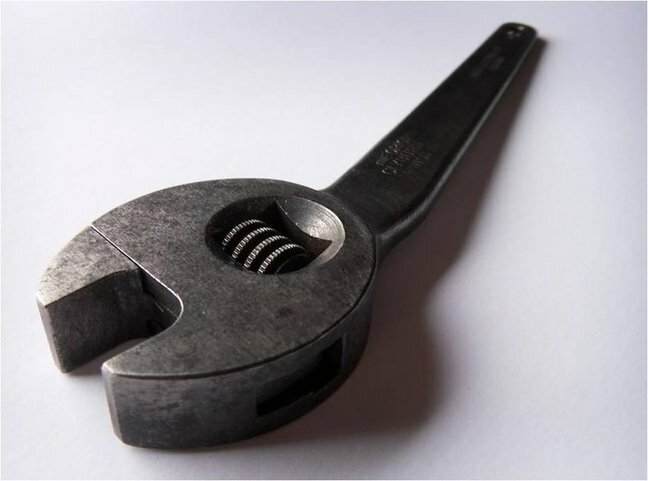 Today the adjustable crescent shaped spanner is used worldwide and throughout Europe where it is often referred to as the 'English key' (Clé anglaise - French.) or simply a 'Clyburn Spanner'. It was made under license in several countries. The spanner, from Germanic spannen (tighten), in a modern sense is a different tool to the wrench, olde English to twist.